This crispy skinned salmon is perfectly complemented by the sweetness of the balsamic glaze. If needed, remove the bones from the salmon using a pair of fish tweezers and clean any excess fat and skin off the fillet, cut steaks into 150 g portions. Season the salmon with KNORR Aromat and a portion of the olive oil. Preheat and large flat grill pan and lightly cook the salmon on both sides until the salmon is still pink and moist on the inside. Blanch the asparagus in a large pot of boiling salted water until tender, but still retaining the bright green colour. In a large roasting tray place the tomatoes and season with a little olive oil and KNORR Aromat bake in a preheated oven (180 degree Celsius) until the skin starts splitting, remove from oven and set aside. 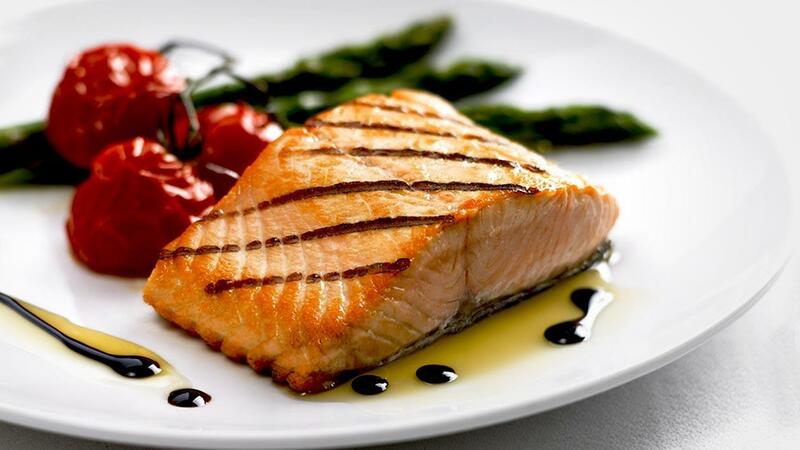 Place the cooked asparagus and tomatoes on a large plate, place the grilled salmon on top and drizzle with the olive oil and KNORR Italian Glaze with Balsamic. Fish will keep cooking even after you remove it from the heat, so it is best to slightly undercook your fish so when it reaches the table it should be perfect.